Alcatel today announced a new variant of the Idol 4S with Windows 10 Mobile on board. This handset carries over the chassis of the Android-based model, but changes a number of key specifications. For example, the Windows Idol 4S has a 5.5-inch full HD display and Snapdragon 820 processor, which differ from the quad HD display and Snapdragon 652 processor of the original. Further, the Windows version improves the camera to 21 megapixels and swaps microUSB for USB Type-C. Most other specs are the same. The Idol 4S with Windows 10 has a wide-angle 8-megapixel selfie camera, 3,000mAh battery, 4 GB of RAM, 64 GB of storage, stereo speakers, and a rear-mounted fingerprint sensor. The Idol 4S with Windows is compatible with Continuum, which enables it to act like a full PC with the proper accessories. It will be packaged with a set of virtual reality goggles for a limited time. The Idol 4S with Windows 10 hits T-Mobile stores November 10 for $470. Alcatel today made its Idol 4S with Windows 10 smartphone available unlocked from the Microsoft Store. 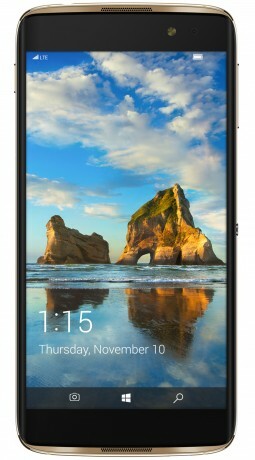 The Windows Idol 4S has a 5.5-inch full HD display, Snapdragon 820 processor, 21-megapixel camera, and USB Type-C. I like the SD 820 upgrade. Hopefully will be user friendly as well as app friendly with the Windows on board.